Rad was attending Bishop's University, playing football, and living in Lennoxville, Quebec when war broke out. He joined the Sherbrooke Fusilier Regiment within the year as a 2nd lieutenant. At the time the SFRs were infantrymen, so Rad trained as an infantry officer for more than a year. But after a stint doing garrison duty in the British colony of Newfoundland, the unit was converted to an armoured regiment in February of 1942 and sent to Debert, Nova Scotia for armoured training. It would be two more years of armoured training in Canada and the United Kingdom before the Sherbrooke Fusilier Regiment would land as the reserve tank battalion on D-Day. The next day, D+1, would be their baptism of fire. 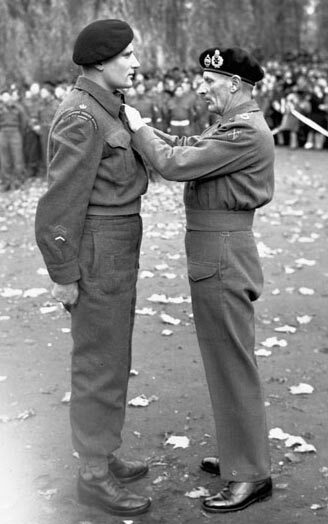 Rad would win the Military Cross for actions at Buron, Normandy in July (see photo at right), and the Distinguished Service Order for a number of actions later in the war. Twenty-four-year-old Maj. S. V. (Woppy) Radley-Walters from the Gaspé Coast and his crew of four in their Sherman tank named "Caribou" are the leading tank destroyers in the Canadian armored units in France. Their score now is 12 German tanks knocked out and the Caribou is still rolling with the same crew. Radley Walters and his men are members of the Sherbrooke Fusiliers, a regiment which has made a fabulous name for itself in this Normandy campaign. They landed on D-Day with the regiment and have fought with it in every battle since. The youthful major, who lived most of his life at Shigawake, Que., and whose father, Rev. A. R. Radley-Walters, now is rector of St. Peter’s in Quebec City, said they got their first German tank near Buron in the action there the day after landing. This was believed to be the first enemy tank destroyed in the battle of France. The Caribou, which mounts a 75-millimetre gun, destroyed two more German tanks later in fighting at Buron and got another near Thaon when the regiment was moving over to Bretteville to support western infantry there. Another kill was made south of Bretteville and yet another in a second battle at Buron. These Canadian aces also destroyed a self-propelled gun at Buron, but that was not included in their tank kills, although such weapons are just as formidable and as heavily armored as tanks. The biggest two days the major and his men had were at St. Andre, south of Caen, when they knocked out two tanks one day and four the next. The four were destroyed in 15 minutes. Gunner in the crew is Paul Paquette, French-speaking Canadian from Kirkland Lake, Ont., where, he worked in an hotel. Paul is short and weighs only 108 pounds but is a giant where his gun is concerned and his regiment calls him "grand Paul" — big Paul. The loader operator is Jimmy McDougall, Hamilton, Ont., and the driver is L./Cpl. Ed Herman, also of Hamilton. The co-driver is R.B. Taylor, St. John's Nfld. The major and Taylor thought up the name Caribou, the former remarking: “after all, we hunted them all our lives, Taylor in Newfoundland and me in Gaspe." For nearly two months this crew has been in the line, engaged in battles or skirmishes every few days with enemy tanks, guns and infantry. During the battle for Caen, the Caribou was right in the fore and was the second tank to enter the city in support of the Stormont Dundas and Glengary Hlghlanders. Radley-Walters is a tall, well-built officer with closely-cropped blond hair. He was attending Bishops’ College at Lennoxville, Que., preliminary to studying medicine at McGill when he joined the Fusiliers in 1940.